Has technological progress stopped or reached a peak in the Star Wars universe? In the last 30 years, human technology has developed massively. Every year a new smartphone is released with a faster processor, more memory, better features. Why hasn't the same level of progress happened in the Star Wars universe? In The Phantom Menace, we see a number of droids - R2 units, C-3PO, Pit Droids, etc. In Return of the Jedi - the droids we see pretty much have the same capabilities. I would have thought that technology would still be progressing in the Star Wars universe - but it appears to have stopped. During wars on Earth, our technology capabilities grow - so it can't just be the effect of a massive war which is causing the stagnation of development. I'm no Star Wars expert, so I could be WAY off base; but it seems pretty straightforward to me that this is not (and hasn't been for a very, very long time) a society that values the advancement of technology. The fact that they HAVE (from our perspective) advanced technology does not mean they value it. I view it as being analogous to our so-called Dark Ages in history, where innovation occurred at a very slow pace (again, from our modern perspective). During this time, "innovation" was not really recognized or valued at a cultural scale, as it is today; rather, all that mattered was survival (and if you had the chops for it, conquest). Similarly, most of the Star Wars universe seems to have a Dark Ages or "frontier" element to it -- and not in the "brave new frontier" sort of way so much as the "untamed wilderness" sort of way. Until the Empire, the "republic" is a loose confederation of sovereigns; in practice, everything feels pretty ad hoc. Most of these have different variations of the so-called "advanced" technology -- but how long have the same fundamental technologies existed? Millennia, it would seem. Occasionally someone tweaked a concept here or there -- for practical purposes, mind you, but not for the sake of pursuing knowledge or innovation for it's own sake. Are there scientists in the Star Wars universe? Probably, but I've never heard of one. Are there career inventors? Surely, but none so famous as Anakin -- who, if we're being honest, was merely a clever tinkerer. So considering these notions, I think it's safe to say that the Star Wars universe was in a pretty unenlightened state for long time before the Empire came about. Not that I want to give props to the Emperor and his cronies, but hey -- no one else thought of building a moon-sized space station with planet-busting capabilities. And I hear they have cookies. Let's consider the settings for the two trilogies. Tatooine, a schizo-desert planet with dangerous pod races we never see in the original trilogy. Geonosis, a huge red planet with a huge droid factory on it. Kamino, a far-away planet that is mostly storm; inhabited by strange aliens with an unusual obsession with cloning and no background checks on their clients. A lot of the major locations for the second trilogy don't have much reason to host high-tech gadgetry, so it makes sense that we don't see a whole lot of it. It also makes sense because these movies were made before the I-III trilogy, with a lot less CGI, so they weren't capable of showing as much high-tech wizardry. That being said, when we DO see examples of 'modern technology' in the IV-VI trilogy, it is massive and amazing - entire cities floating in clouds, space stations that have been decades in the making that are the size of entire planets. Not to mention the incremental improvements mentioned in DarkHeart's answer. It also helps to keep in mind that the original trilogy is largely focused on the rebel alliance, which is far-flung and stationed on remote planets not likely to have access to high-technology. The empire is much better equipped, but we don't see them as much. Look at the prosthetic hand that Luke gets, vs the prosthetic that Anakin gets in the original. This was a deliberate choice by the directors to show that there was some advancement in at least medical technology between the two series. See this question Why is Luke's cybernetic hand superior to the one Anakin receives? TLDR - there is very little in the New Republic which is significantly more advanced than anything in the Old Republic or the Infinite Empire. In some cases the old empires seem more advanced. In fact, much of the technology we by the end of the OT has some basis in Rakatan tehnology. This includes even lightsaber, which had a precursor as a Rakatan force-saber. Certainly by the time of the Old Republic, we see pretty much the same technology that we have in the original series. Droid-wise we see HK-47 nearly 4,000BY, who is seems every bit as advanced as C3P0 or even assassin droids of the New Republic time. In fact, some of it is more impressive - some of the truly ancient stuff is either magical or so advanced as to appear magical. Another valid comparison is the Ebon Hawk to the Millenium Falcon. The Ebon Hawk is several thousand years old compared to the Falcon and is nearly comparable in every way. The Falcon is faster and somewhat larger. A modern day real world comparison cannot be made, if we tried to compare vehicular technology between now and 4,000 years ago ... you would be comparing the Space Shuttle to a rock. The Star Forge drew energy and matter from a nearby star which, when combined with the power of the Force, was capable of creating an endless supply of ships, droids, and other war material. The Mass Shadow Generator drew upon the natural mass shadows generated by planetary bodies. At Malachor V, the gravitation anomalies at work within the Malachor system allowed it to unleash catastrophic devastation upon anything within close proximity of the planet. The superweapon was designed to take advantage of the unique gravitational fields present at Malachor V, but it would later be speculated that the weapon could be modified to function within any star system. The Mass Shadow Generator was capable of gravely damaging or destroying any ships or space stations in orbit above the target world, but it also annihilated virtually everything upon the planet's surface. The Sun Crusher was a nearly indestructible craft that was no larger than a starfighter, but was capable of unleashing destruction on a magnitude that dwarfed even the Death Star's capabilities. Unlike the Death Star, which destroyed individual planets, the Sun Crusher could destroy an entire star system by causing its target star to turn into a supernova. The key to its near invincibility was layered Quantum-crystalline armor, a material so strong that it could perfectly repel even turbolaser shots. The Sun Crusher's construction began around the same time as the first Death Star. This, however, does seem a rare outlier compared to the rest of Star Wars tech which has remained largely the same. What about all that stuff the empire built? 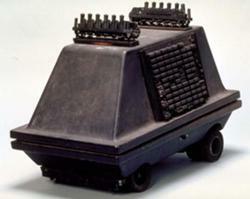 They even had their own set of droids such as the MSE-6-series repair droid. Not to forget the Rebel Alliance! A-Wings, X-Wings, etc. None of which were in the first set of films. Not every planet is going to have the same technological advances and also, it wasn't that long between Episode I and Episode VI. Anakin/Vader appeared in every episode. The tech level mostly stagnated in the period from old to new republic. There are other most advanced civilizations in the past: Rakata and Gree. At the republic's time actual grees cannot understand ancient gree technology and rakatas are almost extincts. Planetary destruction weapons are shows sometimes. Example: Tatooine was once a nice earth like planet before rakata used a weapon to "turn all soil into glass" and kill all flora (and most fauna) later that glass shattered to sand. Tech level appears to fluctuate a bit at a millenia rate. References: Dawn of Jedi comics books series, SWTOR in game codex lore. You'll note that it is equipped with shielding, an internal hyperdrive, is armed with 2 heavy laser cannons and two proton torpedo launchers. It's also capable of pushing out an astounding 160 MGLT (and since it has shielding it was probably capable of diverting power to thrusters to go even faster, but that's conjecture on my part.) What we do know is they saw service for 3000 years, were continually improved over that time, so these stats are probably the last recorded for the class. Let's compare that to an Eta-2 Actis-class light interceptor from the Prequels (http://starwars.wikia.com/wiki/Eta-2_Actis-class_light_interceptor.) You'll immediately note that it requires an external hyperdrive ring, no shielding, and armed with twin lason cannons, and twin light ion cannons. Not a massive indication of backsliding technology, as having less mass could make for a more agile fighter. Top speed is 125 MGLT, and since it has no shields, I'm going to assume that means that not as much power could be diverted to them to increase that. Still that's very fast. Our final comparison ship is the RZ-1 A-wing interceptor, touted as the fastest ship in the Rebel alliance, and a match for the Tie Interceptor. Top speed, however of 120 MGLT makes it the slowest, yet the most up to date, of the three. Internal Hyperdrive (with a rating of 1.0 no less!) and shielding, as well as twin laser cannons and twin concussion missile launchers. Concussion missiles are faster then proton torpedoes, and thus more useful in a dogfight, but are weaker as a trade off. Also note personal stealth devices have also completely (forgive the pun) disappeared. A once common piece of tech in the KOTOR era, now lost. I know that cloaks in Original Trilogy era can only be fitted on starships. As for why this is happened, I suspect it's a long ranging plan of Sith origin. Possibly to reduce the resources of the common herd, to make them easier to subjugate. Please refute me if you feel none of this adds up or I'm seeing patterns where there are none. The technology advances we have experienced in the last 100+ years is more of an anomaly than the norm. In the time before the 20th century significant technology advances occurred at a much slower rate, on the order of hundreds of years. A person born in, say, 1400 Europe, would probably not feel all that out of place in 1600 Europe - things just didn't change that much, especially at the level of the common man. I suspect that the pace of technological advance we are currently experiencing is unsustainable over the long run and will eventually slow down as the technologies mature. that's not to say that it will ever slow down to the pace of 300+ years ago, but I doubt it will continue at the current pace for much longer (there is already evidence of this in certain technologies). So I see the Star Wars universe as having reached that level of technological maturity where things just don't change all that much, at least not until and unless a major breakthrough or paradigm shift occurs. As has been pointed out, the time frame from episodes I - VI is really not all that long, much less than a single human lifetime. If the technology of that universe has already matured then there is not much room left for significant change in that short time span. For example, in the time of episode I you already have a galactic republic that is 1000's of years old and encompasses 1000's of star systems - which implies that it spans 1000's of light years (if not the entire galaxy). To have such a large union of star systems requires that interstellar space travel would have had to been around for a very long time and reached a high level of maturity. So you not expect much change (at least in that technology) over the span of the 40-50 years between episode I and VI. Most other technologies in the Star Wars Universe also exhibit a similar level of maturity (e.g., droids have obviously been around for a very long time - they certainly are not treated as a novelty in episode I). Moore's law has marched on for 50 years, and will for some time. It makes sense that over thousands of years this progrss is unsustainable. So eventually computers or droids manufactured dozens or hundreds, maybe even thousands of years apart would not seem that different. There could come a day when technological progress stops. Not the answer you're looking for? Browse other questions tagged star-wars technology droids or ask your own question. Is there a drop in technology between Revenge of The Sith and A New Hope, and is it ever explained in-universe? Why is Luke's cybernetic hand superior to the one Anakin receives? Is the Star Wars galaxy (or the Force) dying? Why there is so little technological progress between times of Old Republic and Star Wars? How did the Talz get on Orto Plutonia? Are the ET like aliens seen in Star Wars Episode 1 ever explicitly named “Brodo Asogi” in canon? Did the sensors in Star Wars universe not have the ability to scan for droids? Are most Star Wars characters illiterate? Are shields in the Star Wars universe the same technology as Lightsabers? What's the status of AI beings in the Star Wars universe: people or property? What exactly are the capabilities and limitations of “scanners” in Star Wars? What do the flags at the pod races represent?